Today over at Kirkus, I weigh in on the sounds of summer. That link is here. Last week, I wrote about Maira Kalman’s picture book biography of Thomas Jefferson, Thomas Jefferson: Life, Liberty and the Pursuit of Everything (Nancy Paulsen Books, January 2014). That link is here, and I’m following up today with some art from the book. Over at Kirkus today, I talk to author-illustrator Duncan Tonatiuh, pictured here, about his newest picture book, Separate Is Never Equal: Sylvia Mendez & Her Family’s Fight for Desegregation (Abrams, May 2014). That link is here. 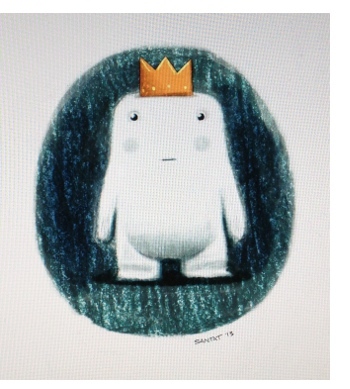 Next week, I’ll have some art from the book, as well as some sketches from Duncan. Photo of Duncan Tonatiuh used with permission of Abrams Books for Young Readers. Now, wouldn’t this have been the perfect post for Mother’s Day a couple Sundays back? Too bad I always do everything backwards. 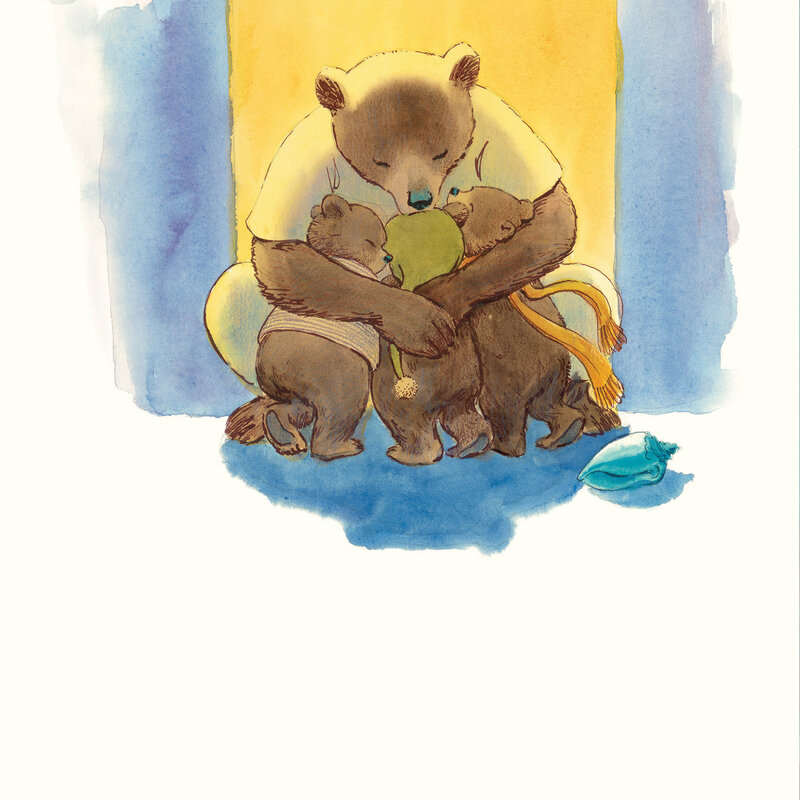 This is art from David Soman’s Three Bears in a Boat, released just this past week by Dial Books for Young Readers. I reviewed this for BookPage, so if you want to read all about it, that link is here. I wanted to be sure to follow up with art. My very favorite illustration from the book is below, too. 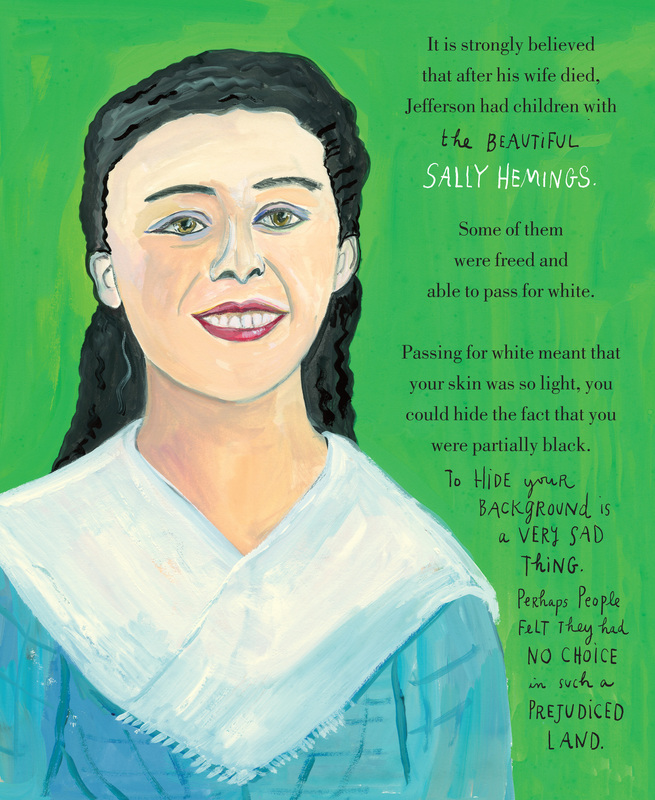 This morning over at Kirkus, I write about Maira Kalman’s newest picture book, Thomas Jefferson: Life, Liberty and the Pursuit of Everything (Nancy Paulsen Books, January 2014). That link is here. 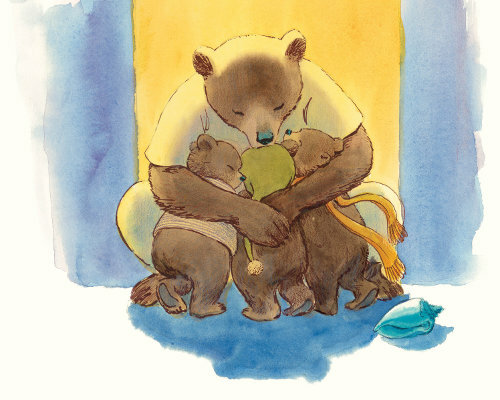 Last week, I wrote about LeUyen Pham’s A Piece of Cake (Balzer + Bray, May 2014) and Phyllis Rowand’s It Is Night (Greenwillow Books, April 2014), illustrated by Laura Dronzek. (As you may have read in the column, these are new illustrations from Dronzek; the book was originally both written and illustrated by Rowand in 1953.) That column is here, and today I follow up with some art from each book. 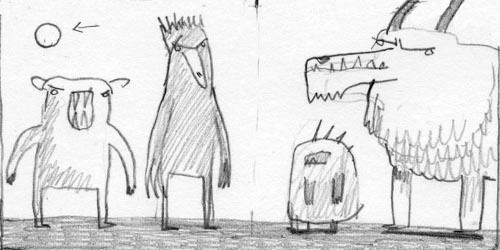 Here’s a post for illustration lovers: Illustrator Daniel Salmieri is visiting to share some character sketches and dummy sketches (and final art) from Big Bad Bubble (Clarion, May 2014), the newest picture book from him and author Adam Rubin. Remember Dragons Love Tacos (2012), which I posted about here? That was a Rubin-Salmieri collaboration (and there have been others), which I still think is one of the funniest picture books you’ll ever read. Rubin and Salmieri have a distinctive sense of humor, and I was going to say something sweeping about how glad I am that they make picture books today, when I just read this from Publishers Weekly: “Rubin and Salmieri are two of the weirdest, funniest guys working in kids’ lit today.” Yep. That. I agree. So, I’ll be skipping my kicks, though I always enjoy reading yours, so please do share. 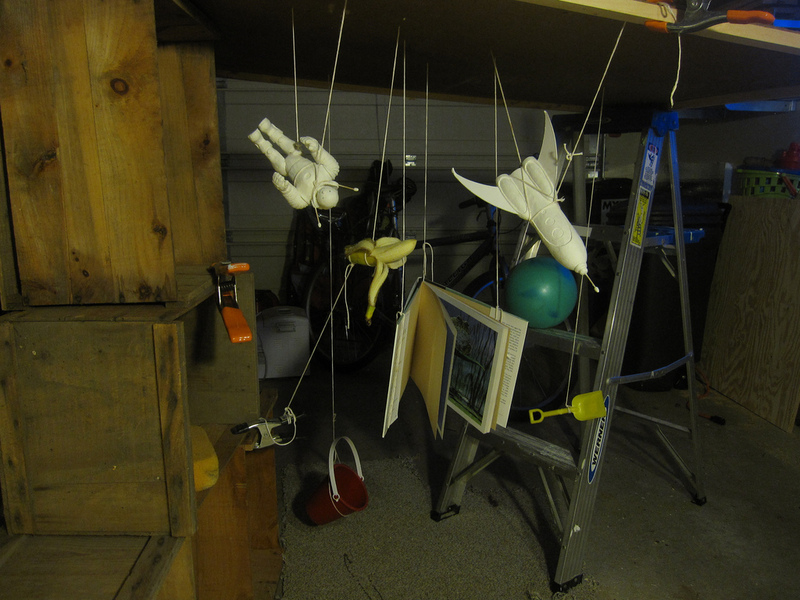 I do, however, have some art for you. 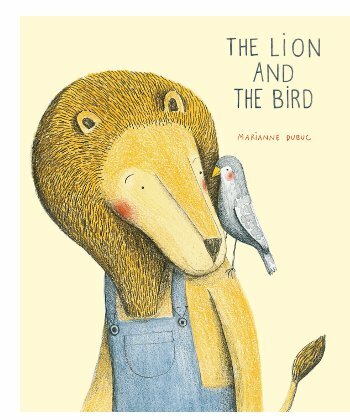 The story is about a lion, who lives alone and one day finds a wounded bird. After nursing the bird lovingly, they become friends, and the bird stays on. 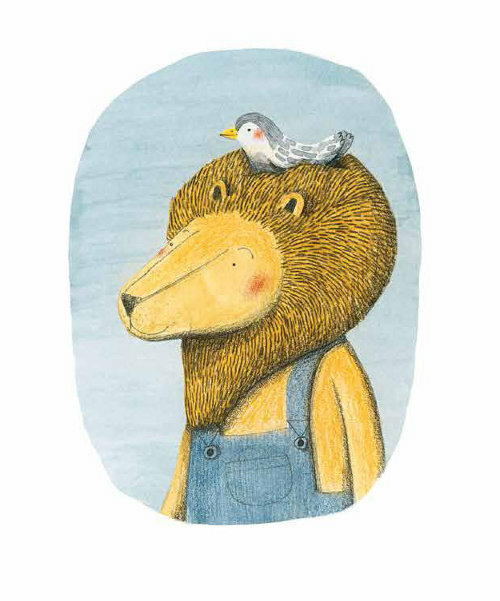 Their friendship grows, but when Spring comes, Lion knows the bird must fly away. Lion adjusts to his loneliness, and then the following Winter, the bird returns. This morning over at Kirkus, I write about two picture books that caught my eye — LeUyen Pham’s A Piece of Cake (Balzer + Bray, May 2014) and Phyllis Rowand’s It Is Night (Greenwillow Books, April 2014), illustrated by Laura Dronzek. Last week, I wrote about Chris Raschka’s new picture book biography, The Cosmobiography of Sun Ra: The Sound of Joy Is Enlightening (Candlewick, May 2014). That link is here, and I’m following up with a bit of art today. Over at Kirkus today, I talk to Jason Chin, pictured here, about his newest picture book, Gravity (Neal Porter/Roaring Brook, April 2014). That link is here. Next week, I’ll have some art from the book, as well as some of the rejected endings that Jason talks about in the piece. 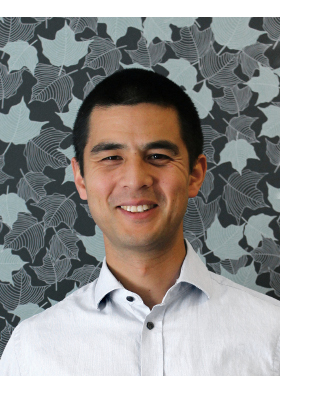 Photo of Jason Chin by Deirdre Gill and used with permission.